The weather outside might be chilly and it might be fall but my smoothie bowl cravings are still going strong, especially in the afternoon! Not that I don’t still enjoy them for breakfast but if I eat before my workout I’m craving a warm bowl of oatmeal, like my Golden Banana Bread Chia Oats, or switch them up with other fruits. If I eat after my workout than it’s usually a protein packed smoothie bowl like this one. 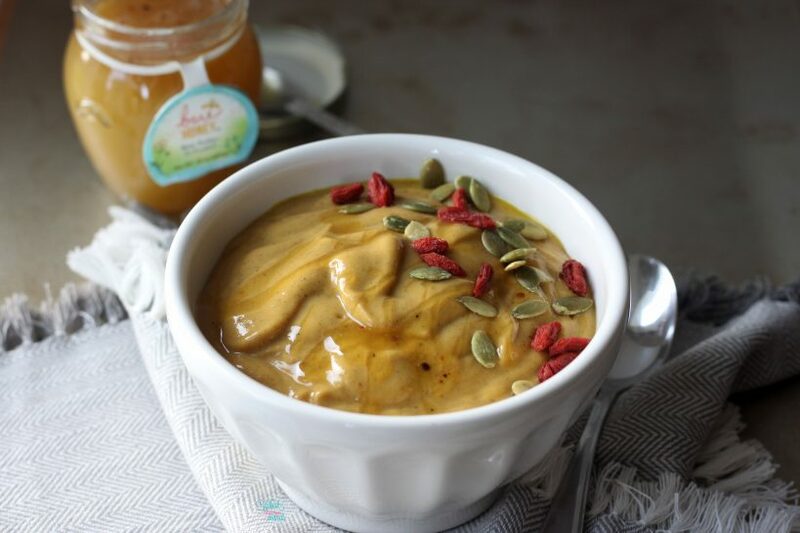 I really love turmeric post workout for inflammation but as I went into greater detail in my Golden Banana Bread Chia Oats and Tropical Turmeric Smoothie Bowl there are so many health benefits to turmeric golden milk. Aside from helping with inflammation a big reason I love it this time of year more than every is for immune health. We rarely get sick and in the past 8 years I think only 1 of us has had strep once. Sure we get the common cold here and there but we don’t get sick nearly as often as many of the people we know. 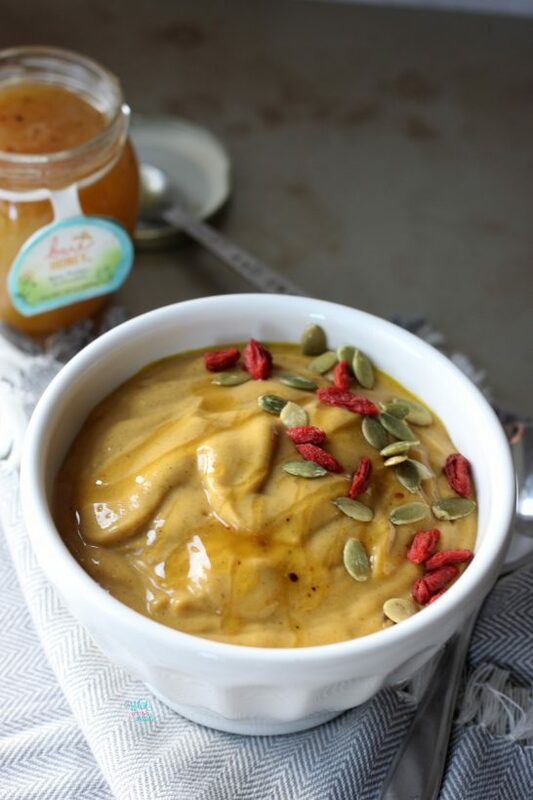 Pairing it with pumpkin is a no brainer and makes for a healthy nutrient packed smoothie bowl that is delicious and hits the spot! If you need a grab and go, like I do some mornings, you can use canned pumpkin puree. 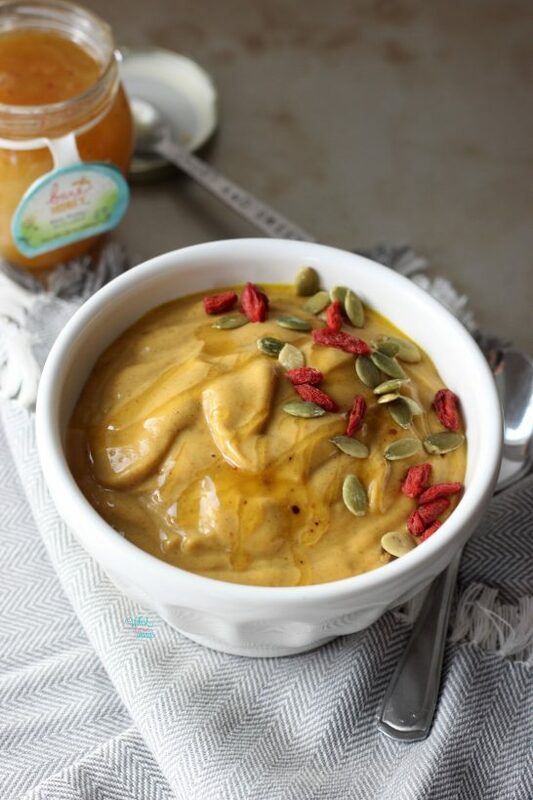 For a rich thick creamy smoothie bowl just freeze the pumpkin puree. Last fall my go to was a Nutty Pumpkin Spice Latte Smoothie Bowl but since there are times I’m trying to cut back on my coffee (what can I say I love everything about coffee, the smell, the taste…) like last week this smoothie bowl is my go to, well at least right now! I know it isn’t chilly every where yet like it is here. Last week we had days highs were going to be 60. Yeah my thoughts exactly, CHILLY! I can’t be the only one who will still throw on wool socks and snuggle up in a blanket, wearing layers, enjoying a smoothie bowl? It’s like ice cream, right? There really isn’t a season. Like I said I’m craving these smoothie bowls in the afternoon. Usually it’s when I have oatmeal or something else for breakfast. I find myself whipping up in the afternoon and it fuels me through afternoon pick-ups, and chauffeuring the girls to gymnastics and soccer. Blend turmeric milk, pumpkin puree, banana, protein powder, and pumpkin pie spice together in a Vitamix, or high-speed blender. If making a smoothie bowl using the tamper tool as needed as it will be thick. Pour into a jar or bowl and top with toppings of choice. Enjoy! 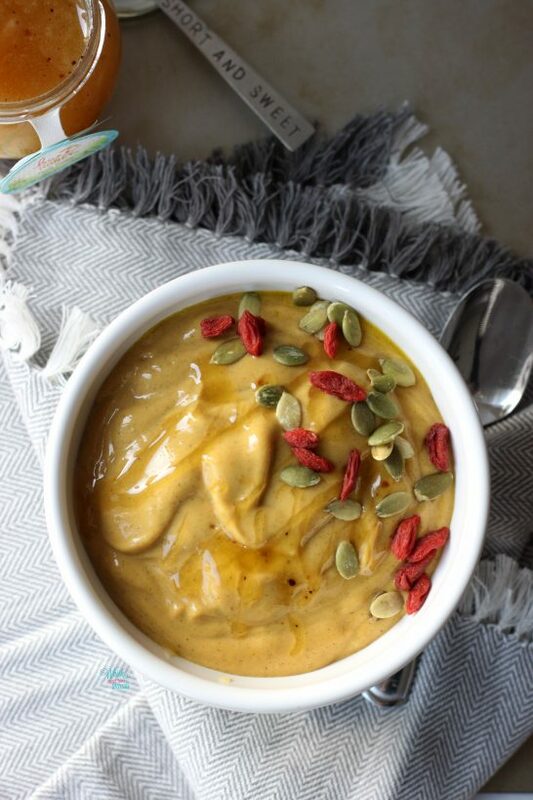 A delicious pumpkin smoothie bowl packed with superfoods to aid in physical recovery and reduce inflammation. While I do receive some Vega products from time to time, which I listed as an option in this recipe, I do purchase much of it on my own. It has been my plant-based protein of choice since before I started blogging. Even though most Vega products used are purchased by myself I do add this disclaimer. I do not make any money off any Vega sales or posts. I only write about foods I love, my blog is an extension of my hobby to make fun healthy food creations for me and my family. Ooh frozen pumpkin sounds delicious! It’s a refreshing treat while still enjoying fall flavors! Hi Sarah! This looks and sounds soooo good and that tumeric is just glowing goodness. Can’t wait to give this a try. Thank you Julie! It’s such a great combo, hope you love it if you try it! I seriously need to jump on the turmeric train! This looks delicious! Yes, it’s so great and pairs with so many things! This sounds delightful! I always have so much extra pumpkin around these day and this smoothie bowls seems like the perfect way to use it up! Thank you Rebecca! It’s a great way to use up that extra pumpkin!